Objective: Despite its possible role in knee arthroplasty, the proximal-distal condylar length (PDCL) of the femur has never been reported in the literature. We conducted an anatomic study of the proximal aspect of the medial femoral condyle to propose a method for measuring the PDCL. Materials and Methods: Inspection of dried bone specimens was carried out to assure the most proximal condylar margin (MPCM) as the eligible starting point to measure the PDCL. Simulation surgery was performed on seven pairs of cadaveric knees to verify the clinical application of measuring the PDCL after locating the MPCM. Interobserver reliability of this procedure was also analyzed. Results: Observation of the bone specimens showed that the MPCM is a concavity formed by the junction of the distal end of the supracondylar ridge and the proximal margin of the medial condyle. This anatomically distinctive structure made the MPCM an unambiguous landmark. The cadaveric simulation surgical dissection demonstrated that the MPCM is easily accessed in a surgical setting, making the measurement of the PDCL plausible. The intraclass correlation coefficient was 0.78, indicating good interobserver reliability for this technique. Conclusion: This study has suggested that the PDCL can be measured based on the MPCM in a surgical setting. PDCL measurement might be useful in joint line position management, selection of femoral component sizes, and other applications related to the proximal-distal dimension of the knee. Further investigation is required. Restoration of the natural geometry during knee arthroplasty is an important goal to achieve normal knee kinematics, which leads to better surgical results ,. To achieve this goal, knowledge of both the qualitative and quantitative anatomy of the knee is crucial. This includes the anterior-posterior and medial-lateral dimensions of the femoral condyle. Manufacturers have used this data to make prostheses. Surgeons measure these dimensions intraoperatively to perform appropriate bone cuts and select components of suitable sizes. By doing so, the preoperative geometry can be restored as planned. There are abundant studies of these measurements, providing useful information for clinical application and related research ,,,,. By contrast, the proximal-distal condylar length (PDCL) of the femur has never been discussed in the literature. Being one of the three dimensions of a cubic object as the femoral condyle, the PDCL (like its counterparts in the other two directions) should play a significant role in knee arthroplasty and deserves investigation. This measurement, dealing with the proximal-distal span of the femoral condyle, must have some implications in the management of the joint line position during knee arthroplasty, as the latter is related to condyle reconstruction in the same dimension ,,,. However, no studies have been conducted on this subject. We felt that the prerequisite to investigate the PDCL was to thoroughly study the anatomy of the proximal aspect of the femoral condyle. Then, an appropriate starting point could be found, from which a meaningful PDCL can be defined and measured. Our objectives in this study were as follows: (1) to find an eligible starting point and (2) to determine if this starting point could be easily accessed during knee arthroplasty to measure the PDCL and determine if this measurement has good interobserver reliability for use by surgeons. The femoral condyle, comprising the medial and lateral condyles, is the expanded distal end of the femur and participates in the formation of the knee joint. When the PDCL is measured, either side of the condyles can be chosen, as they have comparable shapes and sizes. Since the PDCL measurement is performed during an operation and the knee joint is opened mostly through the medial aspect, the medial condyle is selected to take advantage of better accessibility ,,. The anterior half of the medial condyle is the extension of the distal femoral shaft and has no landmark to define the proximal border. The posterior half of the medial condyle or the posterior medial condyle (PMC), however, provides a distinct proximal boundary to allow for measuring. Anatomically, the PMC is confluent with the anterior half of the condyle anteriorly. On its distal and posterior aspects, there is the articular surface. The lateral side of the PMC is the medial wall of the intercondylar fossa. The medial surface of the PMC is the medial aspect of the knee joint familiar to most surgeons. The proximal surface of the PMC, an area not accessed in regular surgery, is overlaid by the joint capsule and the subtendinous bursa of the gastrocnemius muscle ,,. The proximal condylar margin of the PMC is formed by the junction of the proximal and medial surface of the PMC, which is the strategic structure for measuring the PDCL. Since the PMC projects obliquely from the femoral shaft in a posterior and distal direction, it is the most anterior part of this margin or the most proximal condylar margin (MPCM). It marks the most proximal end of a condyle or the starting point of the PDCL and constitutes the focus of our study ,, [Figure 1]. An inspection of dried bone specimens from our anatomy laboratory was performed to investigate the detailed anatomy of the MPCM, with emphasis on its capability as an unambiguous landmark for measurement of the PDCL [Figure 2]. Cadaveric dissections were carried out to test if the MPCM can be found readily and if the PDCL can be measured accordingly in a surgical setting. The authors certified that appropriate consent forms have been obtained at the time participants donated their bodies. Seven fresh frozen cadavers (5 men, 2 women, age at death 49–82 years, average age 68 years) were employed for simulation surgery of a knee arthrotomy for total knee arthroplasty. The joint was incised through a midline skin incision. A medial parapatellar arthrotomy was carried out to expose the joint. The MPCM was located at the proximal aspect of the wound. Once the MPCM was labeled, the distance from this point to the distal condylar tangent, with reference to the anterior–posterior condylar axis, was measured using a caliper [Figure 3]. Two surgeons participated in the dissection. The first surgeon located the MPCM and measured the PDCL on one randomly selected knee of each cadaver. The second surgeon repeated the same procedures on the other knees. All measurements were performed in triplicate, and the mean value was used. By doing so, each surgeon measured untouched knees to avoid any influence from the previous operation. Since knees on both sides presumably had identical anatomy, it was considered that each surgeon conducted experiments on the same group of specimens. This arrangement met the requirement for statistical analysis using an interobserver reliability test. The mean, range, and standard deviation for the measurements of the PDCL on the 14 knees were determined. The intraclass correlation coefficient (ICC) was then calculated to assess interobserver reliability for this measurement using the data obtained by the two surgeons. Statistical analysis was performed using SPSS software (version 17.0; SPSS, Inc., Chicago, IL, USA). 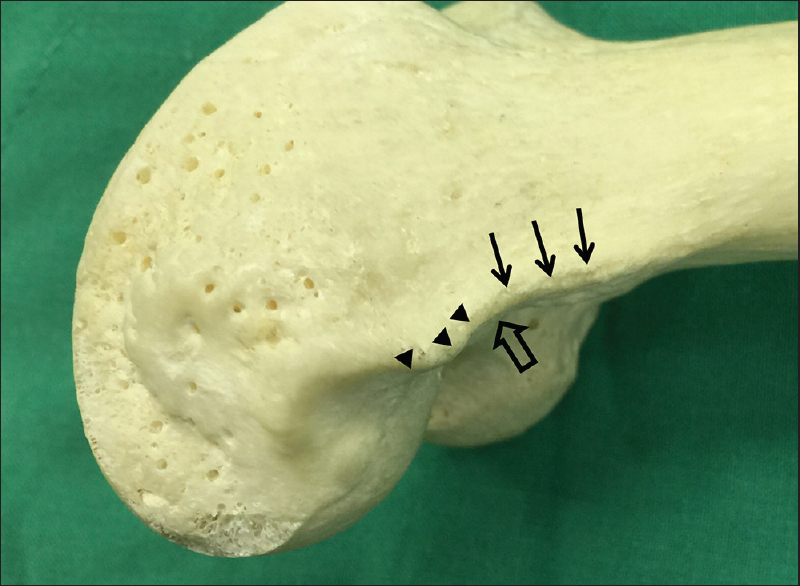 Observation of the proximal aspect of the medial femoral condyle showed that the MPCM is a concavity formed by the junction of the distal end of the medial supracondylar ridge and the proximal condylar margin. This distinctive geography made the MPCM an unambiguous landmark. Looking more closely, the MPCM is a corner structure turning from the medial surface into the proximal surface of the medial condyle. This corner topography means that the MPCM can mark the proximal limit of the condyle (i.e., a tipped instrument can be engaged there to label the site). Anteriorly, the distal end of the medial supracondylar ridge, or the proximal limb of the concavity, furtherly defines the boundary of the MPCL and adds to the precision of locating the MPCM [Figure 2]. Two steps were involved in finding the MPCM in the operative field in the cadaveric simulation surgery: first, determining the approximate location of the MPCM, followed by inserting a tipped instrument to engage and label the MPCM. To find the approximate location of the MPCM, the surgeon might palpate the bony condylar margin in the proximal aspect of the operative field and trace it to the most anterior part with a fingertip. When the overlying soft tissue is thick and hinders palpation, the medial epicondyle could be used as a guide. The MPCM is located about 2 cm proximal to the medial epicondyle along the direction parallel to the femoral shaft. In the next step, the surgeon could use a tipped instrument to pierce the overlying soft tissue and slide the tip of the instrument on the bony surface to and fro to find the “corner” topography at the approximate location of the MPCM. Once the tip reaches and engages this area, it is then turned anteriorly to check the vicinity of the supracondylar ridge to assure that the instrument is confined within the bony concavity and the search is correct [Figure 3]. The above-mentioned technique ensures that the MPCM can be identified without interference from overlying soft tissue layers. At the completion of each observation, open dissection was done in each knee to prove that the landmark was indeed the MPCM as in the dried bone specimen. Although the MPCM is situated on the periphery of the operative field and the space for measurement is limited, the use of a small tipped instrument can offset this problem. Locating the MPCM was easy to perform on all of the 14 knees, with the procedure on each knee being finished within a few seconds. The measuring procedure was performed superficially. The tipped instrument intruded less than 5 mm into the proximal surface of the medial condyle, a depth that would not jeopardize vital structures. The PDCL obtained from the seven pairs of knees was 47 ± 5 mm (range: 41–57 mm). The coefficient of variance was relatively low at 10%. The ICC was estimated at 0.78, indicating this measurement had sound interobserver reliability. It is known that the length, width, and height are three elements of equal importance to define the shape and volume of a cube. The femoral condyle is shaped like a cube, and the anterior-posterior and medial-lateral lengths are two of the three elements. The PDCL measurement is characterized as running from the proximal end to the distal end of the medial femoral condyle, as well as being almost perpendicular to the other two measurements. These properties may account for the PDCL being regarded as the third element. To our knowledge, this is the first study conducted to investigate the PDCL, whose importance for knee arthroplasty has been unnoticed. In fact, several important management strategies in knee arthroplasty fall into the category of maintaining this dimension such as the amount of distal femoral bone cut, the thickness of the femoral component manufactured, and joint line level restoration in revision arthroplasty, to name a few. Currently, surgeons use indirect ways to assure the intactness of this dimension during surgery, for example, measuring the thickness of the osteotomized bone to assure the correctness of the bone cut or using various landmarks other than the MPCM to identify and secure the joint line position ,,,,,,,. Since these indirect approaches are still workable and the anatomy of the MPCM is unfamiliar to most investigators, the PDCL has not been studied previously. If locating the MPCM and measuring the PDCL can be well defined and introduced, it might be more straightforward and logical to use these measures than some of the above-mentioned procedures. Applying the concept of the PDCL to deal with joint line management is a pertinent approach. Currently, various landmarks such as the tibial tuberosity, fibular head, lower pole of the patella, and medial epicondyle are used as references to check the joint line level to determine the adequacy of bone restoration during surgery ,,,,,,,. All of these efforts actually are aimed to restore the preoperative PDCL although none of the above-mentioned landmarks is a direct indicator to evaluate the PDCL. If the MPCM is used as the landmark and the PDCL is the joint line distance value, joint line management would be more direct and meaningful. The surgeons would be automatically reminded of the original meaning of joint line management, i.e., to restore the preoperative proximal-distal span of the femoral condyle as much as possible, and they would better adhere to this important surgical principle during surgery. In addition to joint line management, the PDCL might also play a role in the selection of sizes of femoral components. Each contemporary instrumentation system of knee arthroplasty provides its own gauging device to determine the sizes of femoral components, which is effective and convenient most of the time. When an in-between size is read on the gauging device, the surgeon has to apply additional measurements to decide on the most appropriate size. While many choose to follow the principle of selecting a smaller or larger size according to whether the anterior or posterior referencing system is used ,,, others rely on secondary references such as the medial-lateral dimensions of the femoral condyle . In this regard, the PDCL, which is also a size-indicating dimension, can theoretically be a secondary reference. For example, a smaller or larger component can be chosen depending on a smaller or larger PDCL value. This approach is especially relevant when a good match between the prosthesis and the posterior condyle of the host bone in the proximal to distal direction is desired. 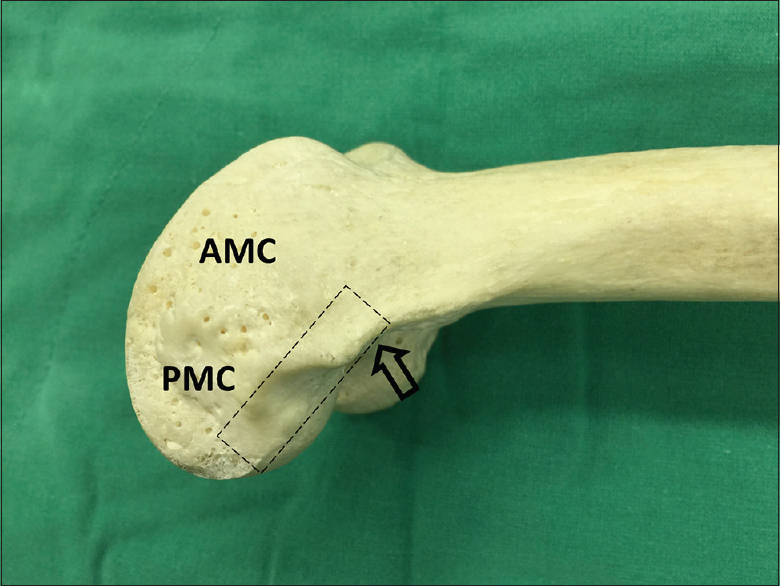 This study elucidated the anatomy of the proximal aspect of the femoral condyle so that the MPCM can be defined and the PDCL measured. The MPCM is located at the very periphery of the operative field in a knee surgery, posing difficulty in reaching this target. In addition, the MPCM is rarely involved in routine surgical procedures. These unfavorable features have prevented investigation of the PDCL. Understanding the anatomy of the proximal aspect of the medial condyle, therefore, is the key to developing a method to measure the PDCL. In this study, we first reviewed the anatomy and determined that the MPCM should be the starting point for measuring the PDCL. In the dried bone specimen study, we observed that the MPCM indeed had a distinctive structure to act as an ideal starting point. Meanwhile, suggested use of a tipped instrument facilitated locating the landmark in such a limited space. In the cadaveric study, we proved that the MPCM could be found readily in a surgical setting. A sound ICC value of 0.78 indicated good interobserver reliability for the PDCL measurement, allowing its application in actual surgeries. The results of the study support the MPCM as an unambiguous starting point for a meaningful PDCL measurement. Although we have defined the landmark of MPCM and proposed measurement of the PDCL, this new technique will be regarded as relevant only when the clinical applications we have discussed prove it is useful. However, in this study, no investigations were performed to evaluate the role of the PDCL in either determination of the joint line position or selection of the size of femoral components. This is a limitation of this study and future work must be done. The technique and data obtained here can act as references for a pilot study for future research. We thank the Anatomy Department of Tzu Chi University for providing materials for the cadaveric dissection. We also thank Jen-Hung Wang (Department of Research, Hualien Tzu Chi Hospital) for advice regarding the statistical analysis. Rodriguez JA, Bhende H, Ranawat CS. Total condylar knee replacement: A 20-year followup study. Clin Orthop Relat Res 2001;388:10-7. Rodricks DJ, Patil S, Pulido P, Colwell CW Jr. Press-fit condylar design total knee arthroplasty. Fourteen to seventeen-year follow-up. J Bone Joint Surg Am 2007;89:89-95. Vaidya SV, Ranawat CS, Aroojis A, Laud NS. Anthropometric measurements to design total knee prostheses for the Indian population. J Arthroplasty 2000;15:79-85. Ho WP, Cheng CK, Liau JJ. Morphometrical measurements of resected surface of femurs in Chinese knees: Correlation to the sizing of current femoral implants. Knee 2006;13:12-4. Yue B, Varadarajan KM, Ai S, Tang T, Rubash HE, Li G. Differences of knee anthropometry between Chinese and white men and women. J Arthroplasty 2011;26:124-30. Li P, Tsai TY, Li JS, Wang S, Zhang Y, Kwon YM, et al. Gender analysis of the anterior femoral condyle geometry of the knee. Knee 2014;21:529-33. Chung BJ, Kang JY, Kang YG, Kim SJ, Kim TK. Clinical implications of femoral anthropometrical features for total knee arthroplasty in Koreans. J Arthroplasty 2015;30:1220-7. Figgie HE 3rd, Goldberg VM, Heiple KG, Moller HS 3rd, Gordon NH. The influence of tibial-patellofemoral location on function of the knee in patients with the posterior stabilized condylar knee prosthesis. J Bone Joint Surg Am 1986;68:1035-40. Yoshii I, Whiteside LA, White SE, Milliano MT. Influence of prosthetic joint line position on knee kinematics and patellar position. J Arthroplasty 1991;6:169-77. Martin JW, Whiteside LA. The influence of joint line position on knee stability after condylar knee arthroplasty. Clin Orthop Relat Res 1990;259:146-56. Partington PF, Sawhney J, Rorabeck CH, Barrack RL, Moore J. Joint line restoration after revision total knee arthroplasty. Clin Orthop Relat Res 1999;367:165-71. Standring S. The anatomical basis of clinical practice. In: Gray's Anatomy. 40th ed. Oxford, UK: Elsevier; 2008. Henry D, Clarke W. Anatomy. In: Scott WN, editor. Insall and Scott Surgery of the Knee. 5th ed. Philadelphia: Elsevier, Churchill Livingstone; 2012. p. 2-45. LaPrade RF, Engebretsen AH, Ly TV, Johansen S, Wentorf FA, Engebretsen L. The anatomy of the medial part of the knee. J Bone Joint Surg Am 2007;89:2000-10. Griffin FM, Math K, Scuderi GR, Insall JN, Poilvache PL. Anatomy of the epicondyles of the distal femur: MRI analysis of normal knees. J Arthroplasty 2000;15:354-9. Hoeffel DP, Rubash HE. Revision total knee arthroplasty: Current rationale and techniques for femoral component revision. Clin Orthop Relat Res 2000;380:116-32. Laskin RS. Joint line position restoration during revision total knee replacement. Clin Orthop Relat Res 2002;404:169-71. Robinson M, Eckhoff DG, Reinig KD, Bagur MM, Bach JM. Variability of landmark identification in total knee arthroplasty. Clin Orthop Relat Res 2006;442:57-62. 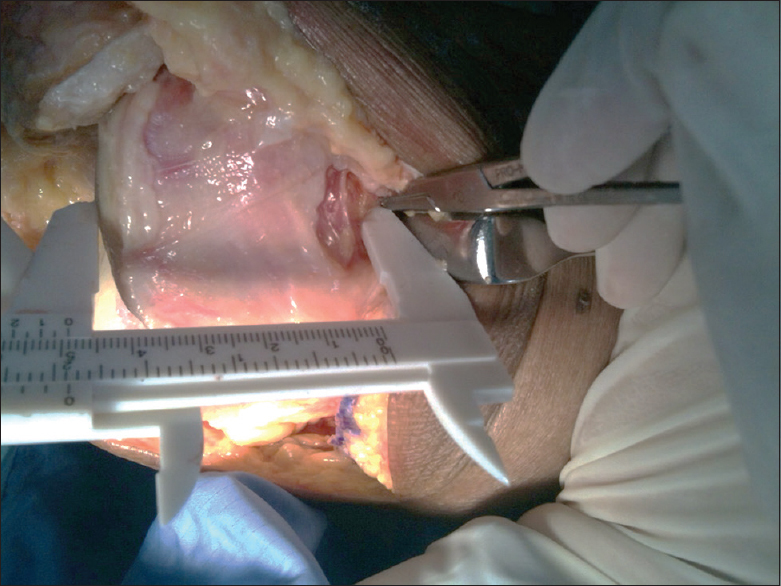 Selvarajah E, Hooper G. Restoration of the joint line in total knee arthroplasty. J Arthroplasty 2009;24:1099-102. Jacofsky DJ, Della Valle CJ, Meneghini RM, Sporer SM, Cercek RM; American Cademy of Orthopaedic Surgeons. Revision total knee arthroplasty: What the practicing orthopaedic surgeon needs to know. J Bone Joint Surg Am 2010;92:1282-92. Tang Q, Zhou Y, Yang D, Tang J, Shao H. The knee joint line position measured from the tibial side in Chinese people. J Arthroplasty 2011;26:989-93. Shakespeare D. Conventional instruments in total knee replacement: What should we do with them? Knee 2006;13:1-6. Tanavalee A, Rojpornpradit T, Khumrak S, Ngarmukos S. The early results of gender-specific total knee arthroplasty in Thai patients. Knee 2011;18:483-7. Henry D, Clarke W. Surgical techniques and instrumentation in total knee arthroplasty. In: Scott WN, editor. Insall and Scott Surgery of the Knee. 5th ed. Philadelphia: Elsevier, Churchill Livingstone; 2012. p. 1042-99.